I think I stumbled upon my passion for clothing in the form of a sustained and happy accident. Along the way, I could have given up and looked for an entirely different hobby. But looking back at how my identity and experiences manifested themselves in the clothes I wear has made the journey a rewarding one to reflect back on. Picture me six or seven years ago. I was still a wee-little adolescent attending international school in the Philippines, the only place I had ever called home. My life was not dictated by any dress code, you would normally find me in a band tee from Hot Topic, a grey American Apparel hoodie, skinny-ish Uniqlo jeans, and Onitsuka Tigers most days. I would begrudgingly put on a poorly-fitted button down shirt when my family went to Sunday Mass and something a bit more fun when I went out with my high school friends. Every once in a while, my dad would bring some of his older clothes into my room as I was getting ready for a night out. 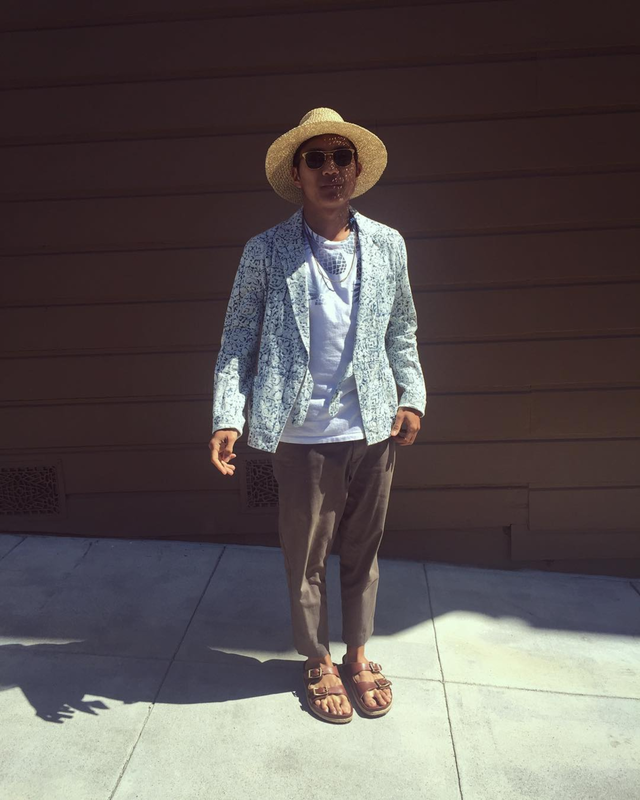 He made fun of my taste in shirts (how ironic because he was the one who would buy said shirts from outlet malls whenever we visited the Bay Area for the summer) and implored me to try on his shirts. They fit perfectly! I would do a double-take when walking past a mirror and mistake myself for a fool, but I still walked out the door in the outfit. I wore those shirts because they carried the stories of my father and I was living his story through my own life. Those were the times when I did not think much about dressing up. A patterned shirt helped me stand out from the crowd, but I wasn’t necessarily comfortable with it. I had close to no self-esteem in high school and lived in a country deeply entrenched in traditional Catholic values – these weren’t exactly the conditions one would expect as conducive towards conceiving a taste in fashion. Fast forward to the slightly wiser Marco who called Wesleyan his home from 2011 to 2015. On paper, I was an average-height international student who chose Mathematical Economics as a major to fulfill my parent’s wishes. I had a hard time making friends at first, but I eventually settled into a close circle of friends who majored in film, dancers whom I spent late nights rehearsing with (instead of hitting the library like I should have), and anyone else who challenged my values and perception of the world. Everyone goes to college to get a degree. But I was lucky enough to realize that to embrace one’s college years is essential; because, this was the only transitional period I had to morph into my own person through the embracing of new experiences and friendships without much consequence. The experience was otherworldly. One I had never thrown myself into, and I soon learned the transformative power of the clothes I wear. A weekly Goodwill visit became a habit because I held a job that allowed me to purchase clothes on the cheap. So it was in the clothing that I wore that sometimes I felt most safe. I could put on a black leather jacket and instantly feel the energy of the many American movie icons that defined suave to the modern man. Other times, I threw on a Barbour over a chunky sweater and could stroll through fallen leaves and hear them crunch satisfyingly under my boots. I graduated from college knowing that putting on clothes and enjoying them gave me a confidence that empowered me to be who I wanted to be. And now you see me today, I wear the clothes I feel the most myself in. 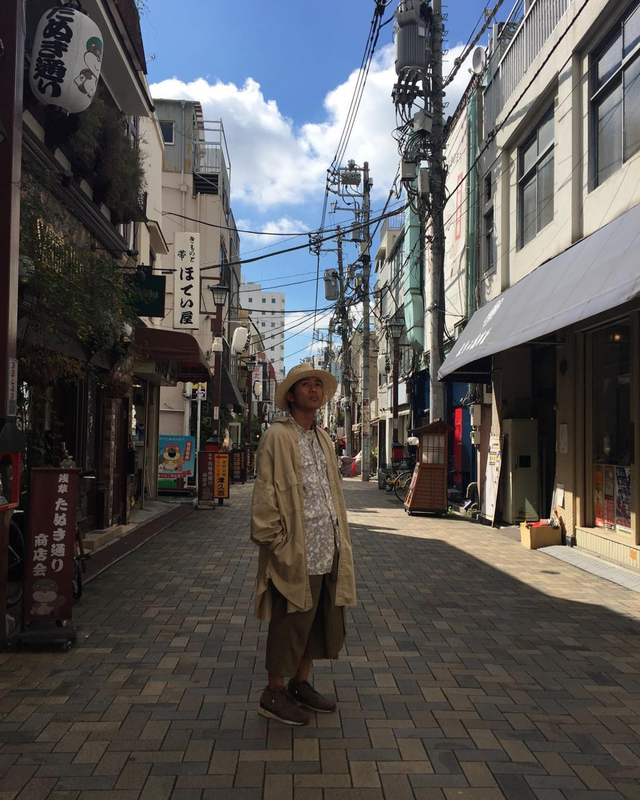 Think of the funkiest and weirdest Americana/counterculture inspired clothes from Japanese designers. The brands I wear revolve around the ethos of sharing a special story. I used to want to wear clothes that made me look good to a stranger on the street, but using them to communicate my own feelings and stories became the most important in 2017. These clothes are imperfectly made but they also nail the details that I look for. 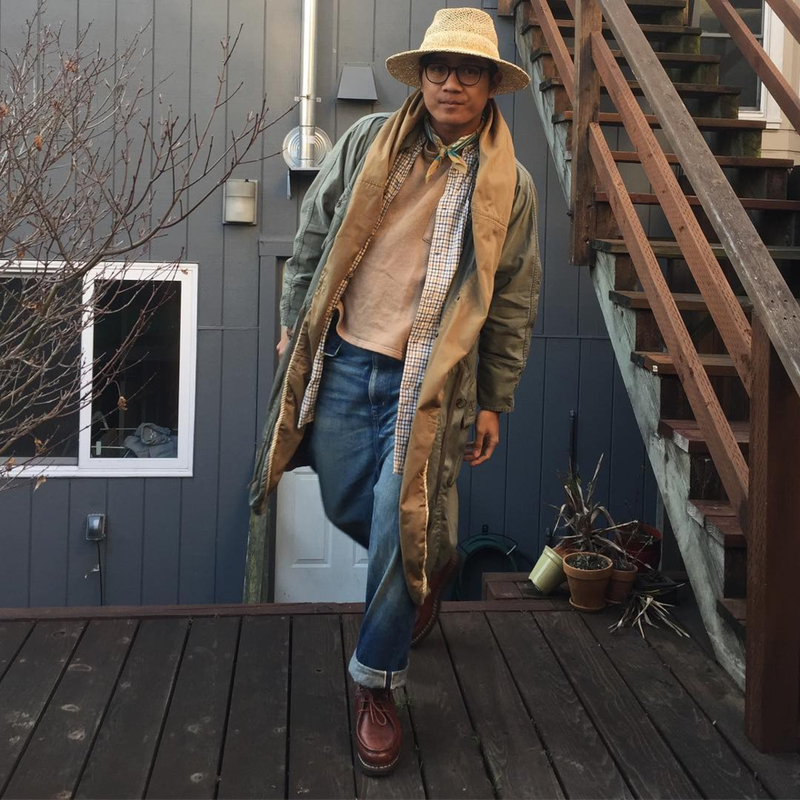 While Engineered Garments reimagines vintage Americana and tailored clothing for the 21st century, Kapital morphs and twists traditional garments into pretty fugly-looking things that make me happy to wear, then there’s the musky Barbour jacket that I throw on when the San Francisco weather decides to operate outside the norm. I can’t put a word or string of words down to describe my style because it changes with my mood and with my surroundings. Maybe this was meant to be because I’ve uprooted myself and made San Francisco my home. I naturally adjust to my surroundings and let myself fly wherever I may find myself. My reflecting on my personal journey has led me to the conclusion that I most identify as a nomad: a wandering, travelling individual who embraces new experiences, relationships, and ideas for the purpose of self-growth. It’s a hobby that I hope to turn into a career someday. This hobby is not a narcissistic endeavor because I don’t believe that I am showing off to people. Rather, I want people to understand the person who wears the clothes...that I have a weird story of how I became the person I am. Whatever I set myself out to do is a chance share my story, why not do that in the best way that I can?